Where to propose in Africa? 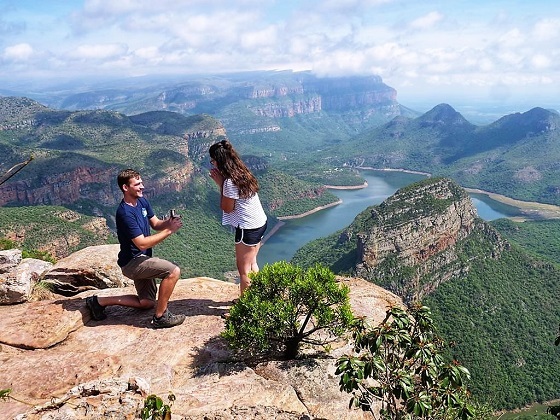 If you are considering popping the question in Africa, look no further than South Africa and The Three Rondavels Viewpoint – Levi Umena surprising Megan Hayward (pictured) with a January proposal in the very same spot. The couple travelled on our 20-day Kruger to Cape Town camping overland adventure, the truck stopping on the Panorama Route to take in the spectacular views. Worth the wait, if you’re prepared to skip Valentines, we are offering a saving of 20% on the 16 March departure if you book before 28 February. Big Five game drives in the Kruger, mountain bike safaris in the Mlilwane Wildlife Sanctuary (optional) and wildlife watching in the Mountain Zebra National Park feature on the itinerary. And, ideal for adventurous couples, there are further stops in the Tsitsikamma National Park, home to wild kayak and lilo tours, and Malealea in Lesotho, riding atop the local Basotho ponies a traditional and thrilling form of travel.